Niki1 please email me at sberkley51 at gmail dot com to claim your prize. Happy Wednesday or Hump Day should I say! Today's card features the adorable little girl and her watermelon called "Summer Sweetness" from High Hopes Stamps! That's one mighty big piece of watermelon for this sweet little girl LOL! 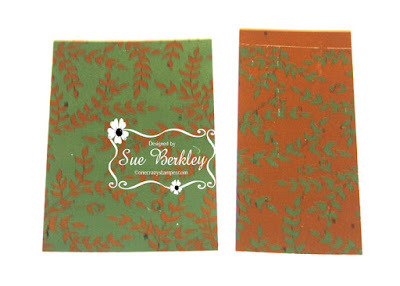 I am using papers from the American Crafts Sunny 6x6 collection! The watermelon paper just fit perfectly! I put a frame around the girl using the Pretty Pink Posh Scallop Square die cut from coordinating paper. 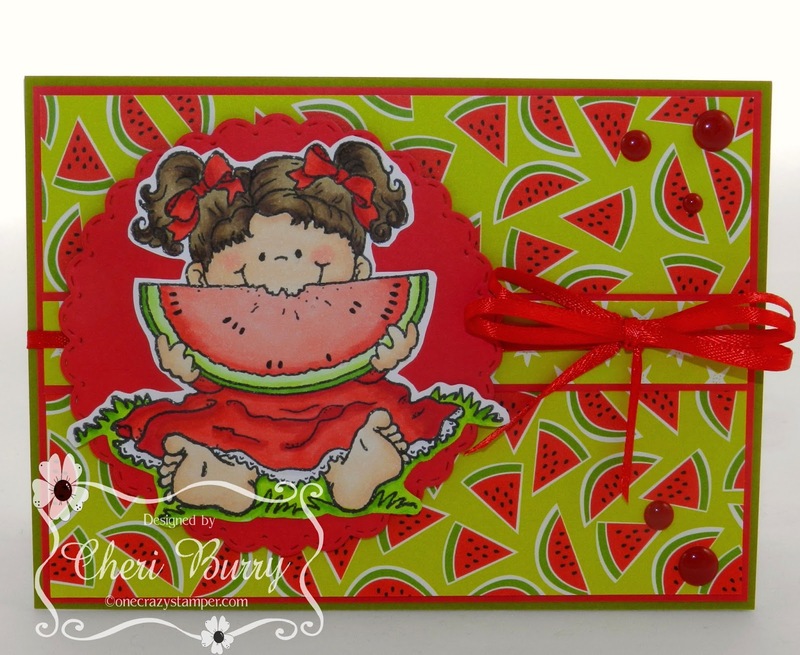 I also cut and layered a small tag from the set that had the matching watermelon theme. Some ribbon, a bow and YNS gumdrops finishes off my card. 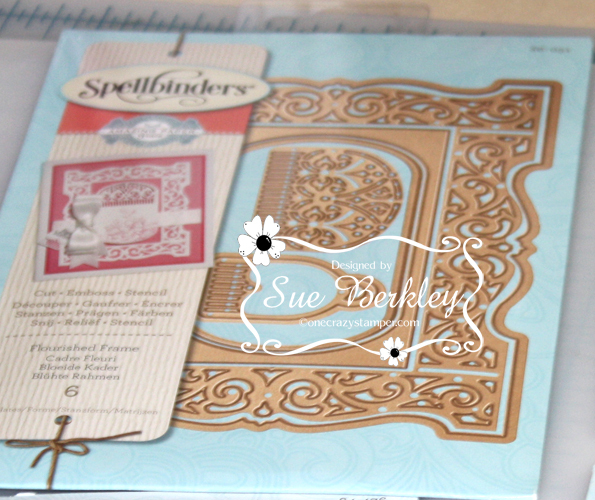 I made a second card and fussy cut around the image layering her on a Memory Box Stitched Scallop die. This is my last Design Team post for One Crazy Stamper. I sure have enjoyed the last year designing for Lora! Her stamps and store are second to none and Lora is one of the kindest, most thoughtful person you could get the chance to meet! 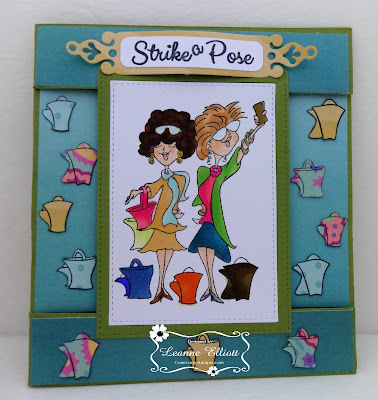 I will still be staying on the High Hopes Stamps (Lora's other passion) Design team so check out the Tuesday HH Blog posts to see me over there! 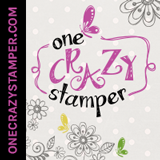 Keep crafting and Happy Stamping! 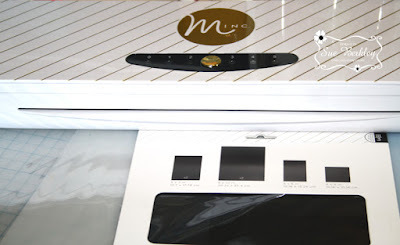 For today's post, I have a tutorial using the Heidi Swapp Minc Machine. 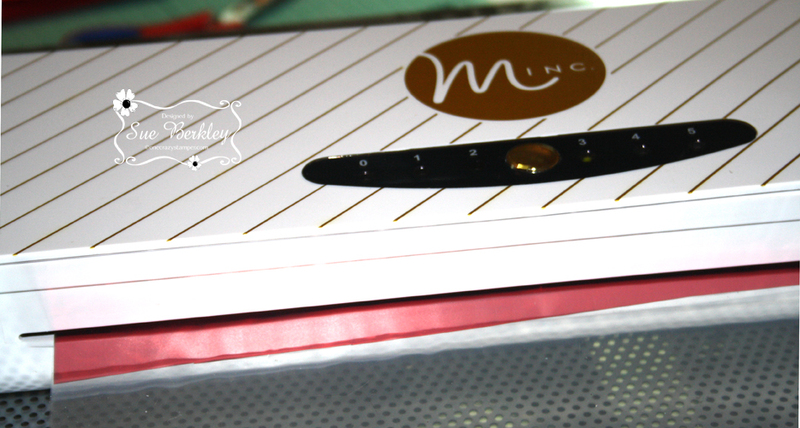 By using the Minc, a foil effect an be added to any project that you are working on. Besides using products by Heidi Swapp, that are ready to be run through the Minc with foil, you can also use the Toner Sheets to cut out dies, make a background and more. This post will be concentrating on the different ways these Toner sheets can be used. Make yourself a coffee or tea and while drinking it browse through the tutorial that I have for using the Heidi Swapp Minc Foil Applicator and the Toner Sheets. The Heidi Swapp Minc Foil Applicator, comes in two sizes (regular and mini) and is very easy to use. The two buttons at the back of the machine are the on/off switch and the other button is a forward/reverse switch. The gold button on top of the machine has the numbers 0 - 2 on the left hand side and 3 - 5 on the right. These numbers are the various heat settings. The bottom left hand corner is the Transfer Holders and the bottom right hand side are the Toner Sheets. Below are some of the Heidi Swapp Reactive Foils, which come in an assortment of colours. that can be used. Below are some of the dies that I used. Sentiment and Red Foil. 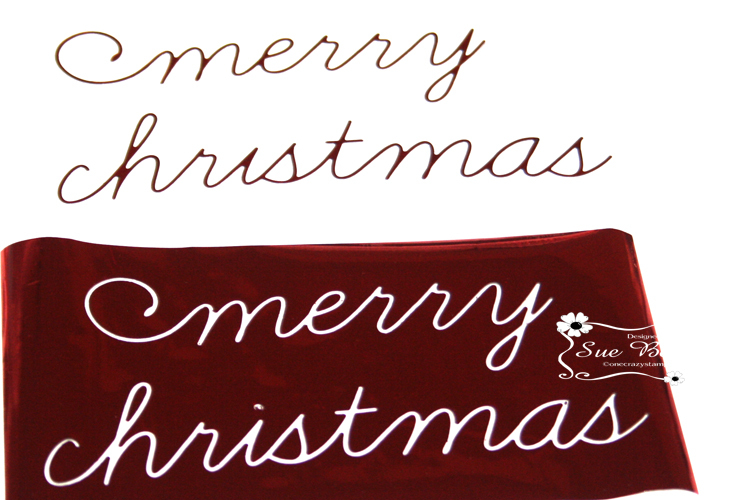 The sentiments were cut with a Toner Sheet using the Big Shot. They were then placed in the Transfer Folder and a piece of red foil was cut to size and put over the sentiment with shining side up. 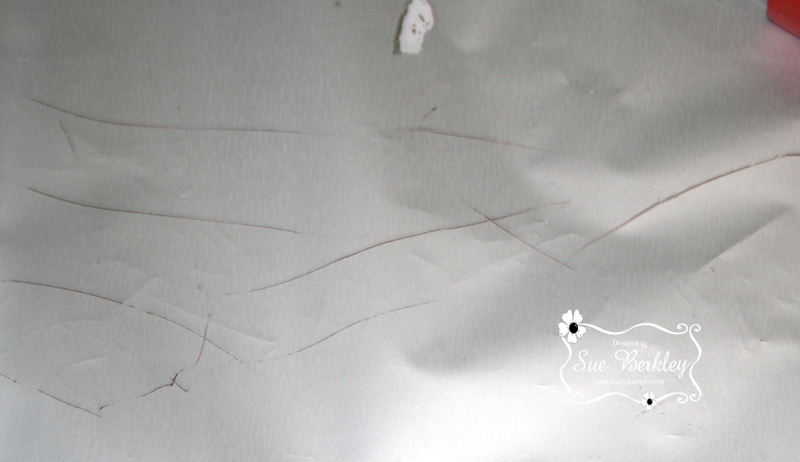 The Transfer Folder was then closed and smoothed out, so that there are no wrinkles. Once the machine is turned on, the heat setting is chosen by pressing the gold circle button. Keep pressing it to you get to the desired heat setting. The recommended heat setting for the Toner Sheets is 3. This is indicated on the back of the package in the upper right hand corner. The transfer folder is then fed through the machine and will come out the other side. This is the end result after it has been foiled. 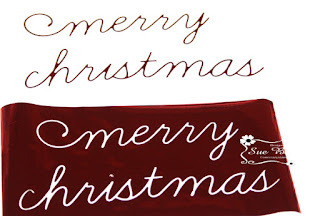 The top is the foiled sentiment and the red foil below is now the negative of the piece of foil. I used a Holographic Foil with the Create-A-Flake die. Each die was foiled and a white brad was added to the center of all the pieces to create the snowflake. The example below is using the die called Labels 46. The frame on the left was foiled in silver and gold was used for the insert. Once an item has been foiled, the left over foil can be used again. This can be run through the machine and what foil wasn't used in the original would be used this time. The foil on the left is the negative of the original that was foiled. The Toner sheet is on the right hand side. I used the Mint Reactive foil to do the original foil. The green in the sample on the left is the foil that was not used in the original. 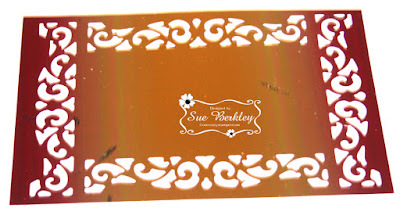 Once that had been run through the machine, I then used the Rose Gold foil to foil what was still showing black. 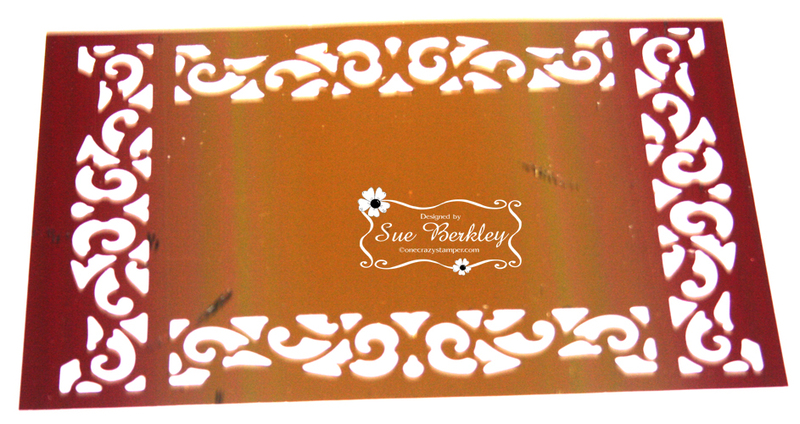 The Silhouette will cut an any image using the Toner Sheets instead of cardstock. 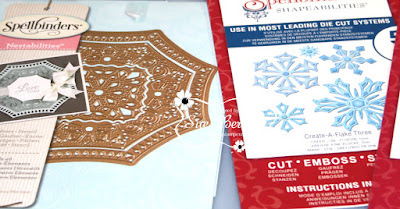 The settings that you used will be the same as for the cardstock. I used the Happy Owl and Tree Stump SVG files, along with the Happy Owl and Tree Stump stamps from the High Hopes Spring 2016 Collection. The SVG cuts were foiled with the Champagne Reactive Foil. 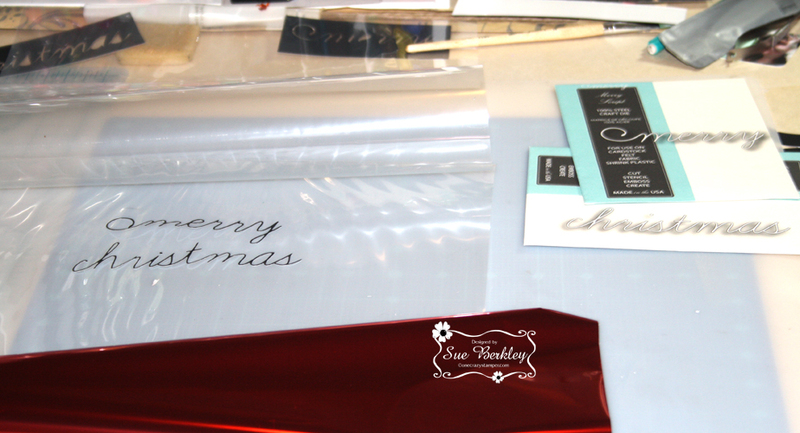 While doing this foiling, I became aware of some minor issues that did not have a good outcome. Any piece of foil that has a mark or a crease will show as a black mark after it has gone through the machine. If there a white spot on the Toner Sheet it will end up as a black mark. Before using the Toner Sheet, I used a dry swifter sheet to wipe any white spots or dust away. If you find you are getting some black marks on the foiled item, lower the heat setting. After a while, the machine gets very hot. Make sure that your scissors are sharp and have a smooth edge, so that you obtain a nice clean cut. 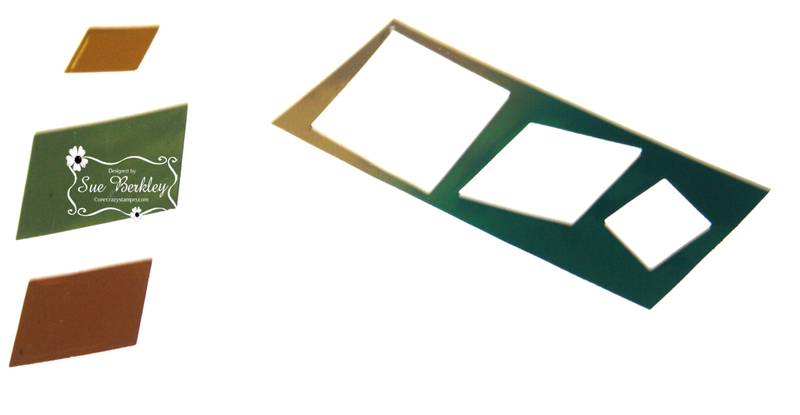 The marks on the piece of foil below, will leave black marks on the foiled item. Black marks on the finished product. Left over foil or small pieces that haven't been used should be stored in a sealed container. This will help to keep the dust away and not damage the foil. 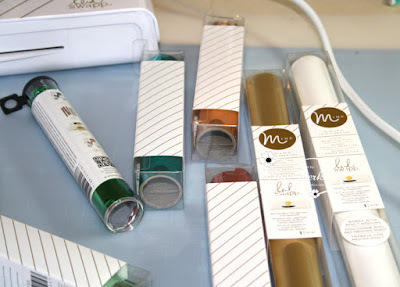 This is only a small portion of what can be done with the Heidi Swapp Minc Foil Applicator. Make sure you check out Lora's OCS store to see what she has available for Heidi Swapp that can be used with the minc. Hope you enjoyed this tutorial, and stay tuned for Friday as there will be a brand new challenge starting for July. 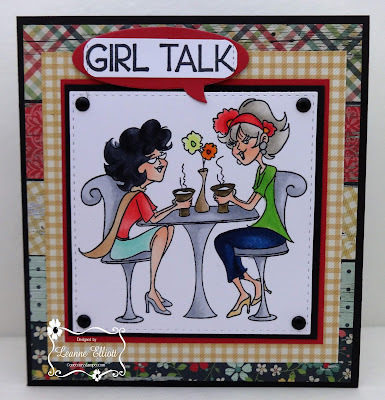 Hello there and yes we still have time for you to play our challenge here at One Crazy Stamper and it is my turn to share with you my card, I actually will share two today. 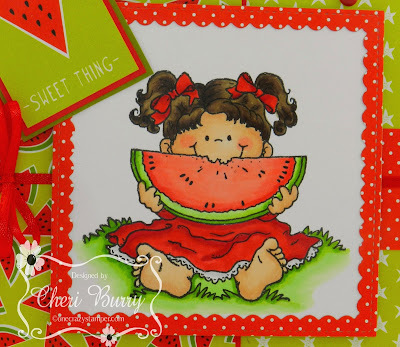 These are from the High Hopes Rubber Stamps Spring Release and were so fun to create my cards with and I had to show you both of these. 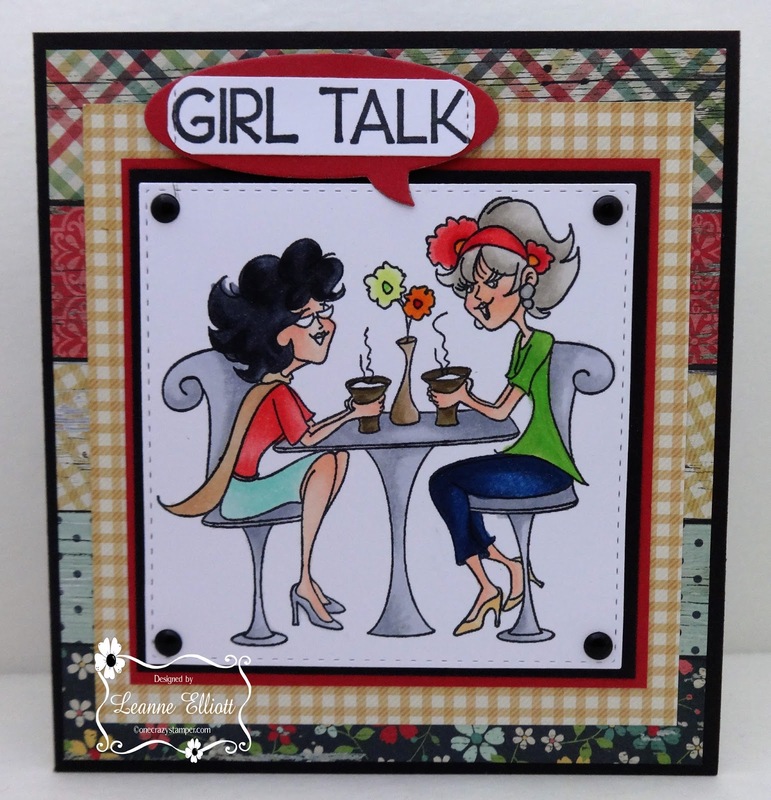 Shopping Divas, Coffee Talk, Strike a Pose, Girl Talk, Simple Stories Pattern Paper, Copic Markers, Metal Dies, Pearls, Craft Foam, Memento Ink, Scissors, MISTI. Thanks again for stopping and I hope you get a chance to play the challenge and stop by Lora's store and pick up a few supplies. Peeking in to share a tutorial using the following High Hopes Stamps..
High Hopes Julies Flight found here! High Hopes Julies Touch found here! High Hopes Julies Wish found here! 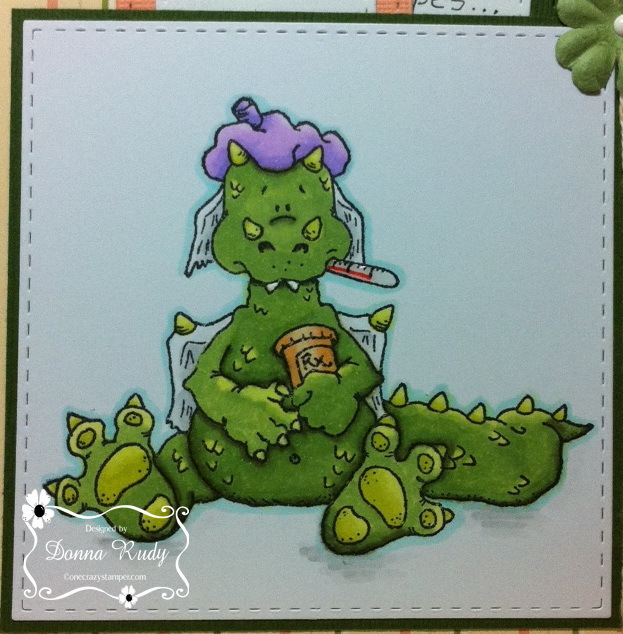 High Hopes Sentiment Set 2 found here! 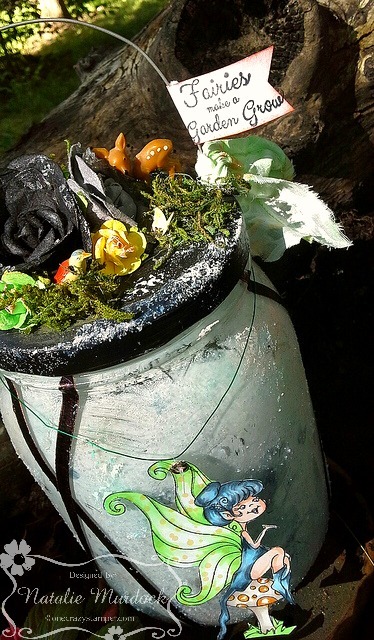 Grab a jar from your recycling bin. I used a pickle jar, you will also need white acrylic paint and a sponge. Next, prepare your images. 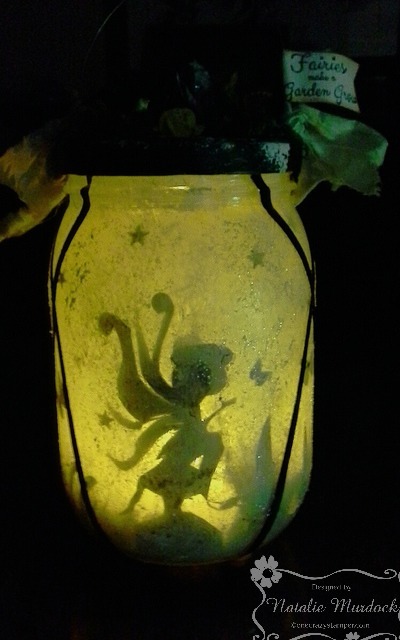 I used all three fairies mentioned above. 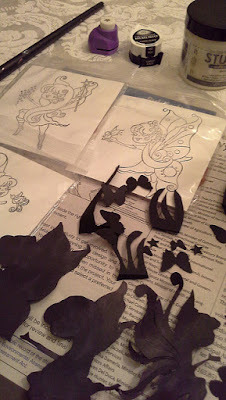 Stamped with black ink, fussy cut and them coloured entirely with a black sharpie marker to create a silhouette effect. Create a base for the faries out of cardstock . Also punch out some butterflies, stars and grassy details from black card stock. Set the images aside for now. 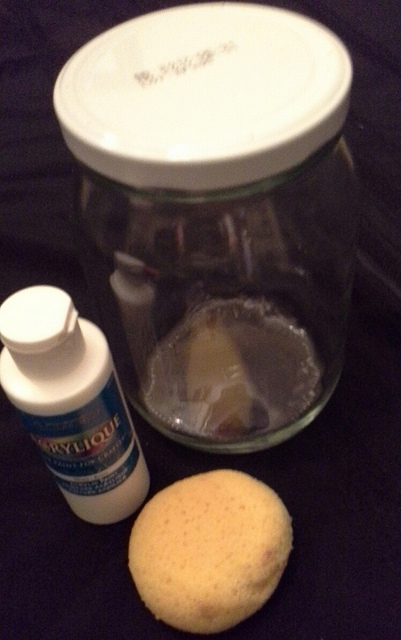 Lightly dampen your sponge with water and apply a light coat of white acrylic paint to the inside of the jar. Let dry. Then add your images, including the fairies, stars, butterflies and grass to the inside of the jar. Use a Matt Medium to adhere the images and die cuts to the sides on the jar (from the inside). Let Dry. Paint your cap and create two holes using a hammer and nail. (I ended up using a softer wire for the handle as the coat hanger was too tough to bend. )Also spaced the handle out a little bit wider on the cap. 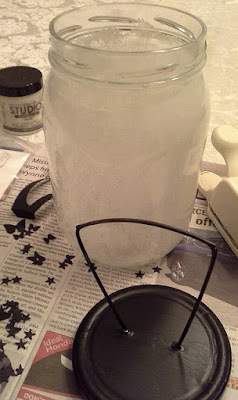 Apply a mixture of matte medium and fine clear glitter to the outside of the jar. 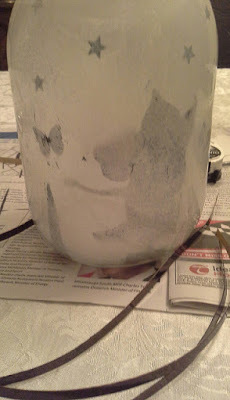 Apply uneven (here and there) just for a textured look to the jar. Decorate your cap. I used faux flowers, green moss, vintage bird and deer and the super cuter :Fairies make a garden grow" sentiment. Oh and add some ribbon to the handel also! 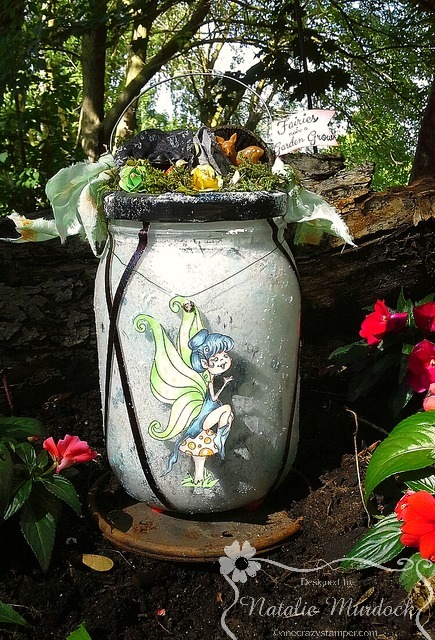 Colour up one of the fairies and fussy cut. I added a eyelet and wire to string around the jar. 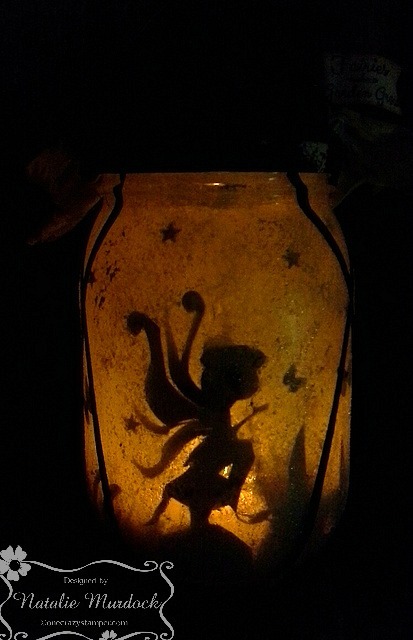 Its really only for show while the lantern is not being used. Otherwise I thought it looked unfinished without this added touch! 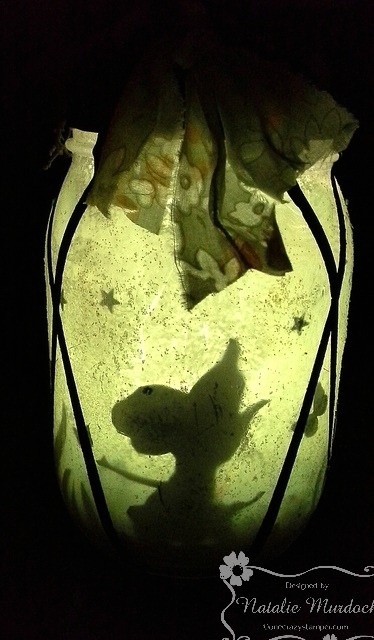 The fairies is on a wire which is easily removed when its time to light up at night! Wow! I can't believe it's officially summer! My card doesn't necessarily have a summer theme but we all know someone who will or has gotten sick as soon as the beautiful weather hits. For me, my allergies usually go into over drive. 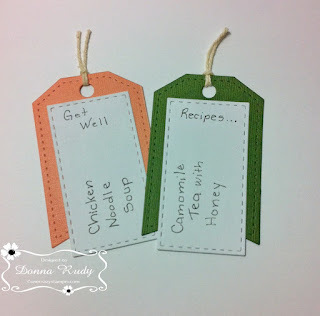 Today I am sharing "Seymore's Sick Day" and the "Better Quickly" sentiment, both from High Hopes Rubber Stamps. 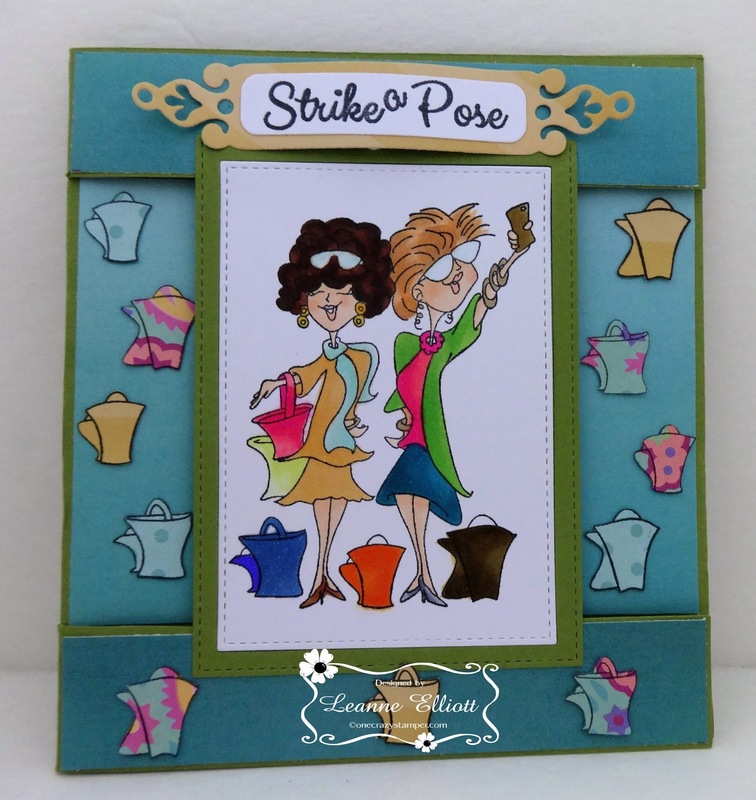 I am also including a photo tutorial for the "Twisted Easel" card base I used for this card. Grab a coffee and enjoy! His teeth are coloured with a white gel pen. The thermometer has glossy accents on it and I used a red marker to make the line. I started my colouring my stamp with alcohol markers cut out using a stitched square die. 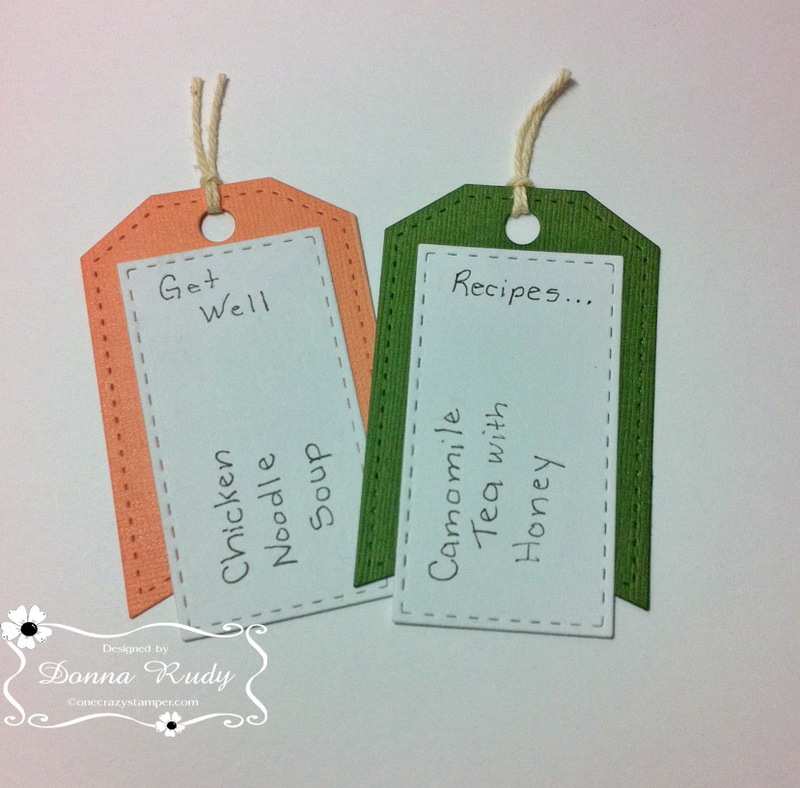 My printer wouldn't let me print even though I had black ink, so I cut out my tags using a stitched tag and stitched rectangles die and added my Get Well Recipes in my own printing with black marker. 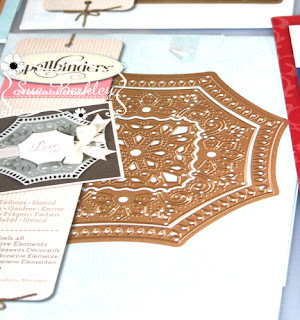 Some twine makes them easy to pull out of the top of the card. A couple flowers and some gumdrops finish off my card. 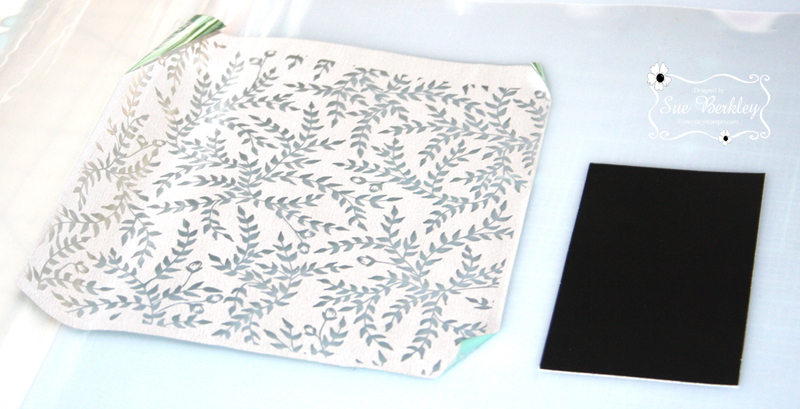 Start by laying your card base on your work area with the fold to your left. You can use whatever size base you will need for the stamp you are using. 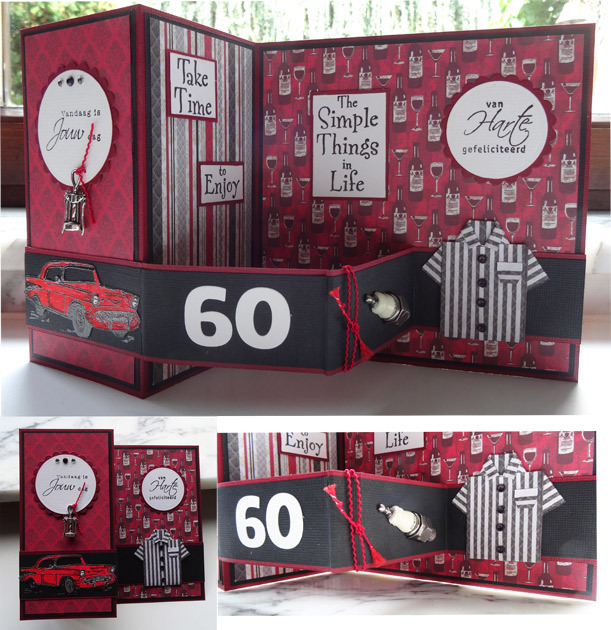 For my card I am using a base that will give me a finished card size of 5x5. Open the card base so your fold is in the middle. Grab your Scor-pal or whatever you use for scoring. This part is a little tricky because you need to line up the top left corner and the bottom right corner on the same score line. Once you have it lined up, score your line. It is very important to remember that you are scoring from the top left corner of the card to the bottom right corner where it meets the fold line. 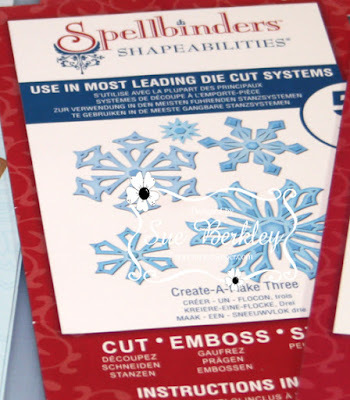 Use a bone folder to crease your score line. The first time I did this I freaked out because the folded "diamond" wouldn't sit down the way it was supposed to. I quickly learned this will sit properly once you have the weight of your stamped piece on it. Cut the base for your stamped (or topper) image to match the size of your finished card. In this case, my base is 5x5 to match my finished card size. Colour and decorate your image as you choose. 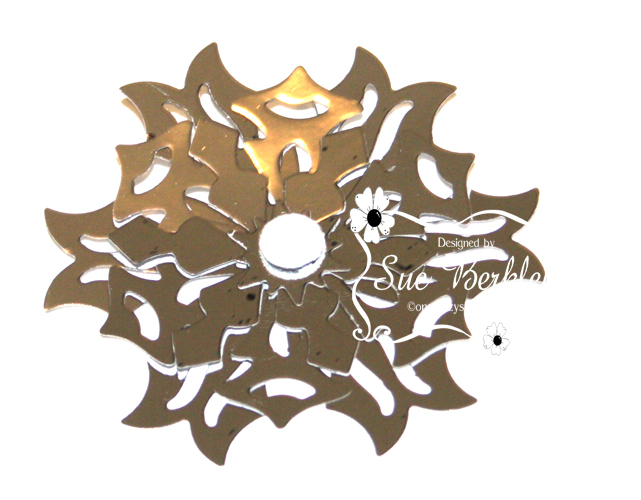 Once it is ready to go, finish your base (the left side where your image will sit) and then add your tape of choice to the "diamond". 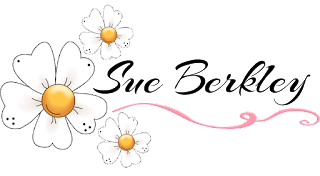 Mount your stamped image and voila! 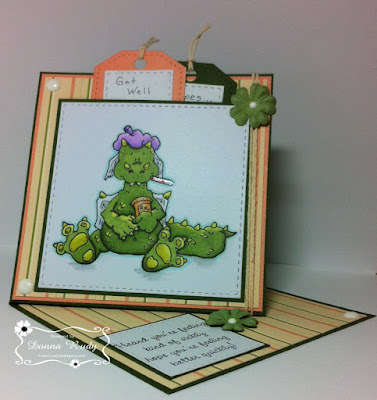 I hope you will give a twisted easel card a try. I honestly was terrified to try it - I thought it sounded like something hard and time consuming......but it truly isn't. They are actually quite easy to make and it's fun to try something different! 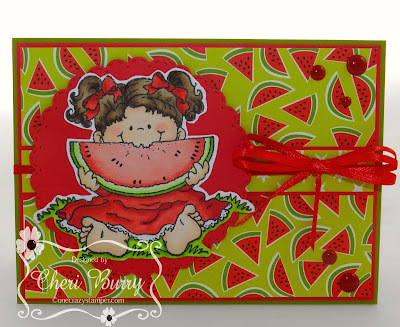 Berry Nice -- High Hopes Stamps!